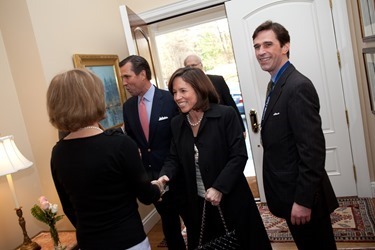 Last Thursday evening I attended a reception at the home of Deacon Chuck Clough and his wife, Gloria. We are very grateful for all of the support that Chuck and others are giving to the Church’s development activities. In these times of economic distress, the demands on our services are ever-increasing, so we are very, very grateful to all of those who have come forward to help us. On Friday afternoon, we made a lightning trip to Houston for the annual cardinals’ dinner to raise scholarship money for The Catholic University of America. The evening started with a Mass at the new cathedral in Houston. This was the first time that I had been in the cathedral and I was very impressed. Archbishop Joseph Fiorenza built it towards the end of his tenure as bishop of Galveston-Houston and, of course, now they not only have a new cathedral but they also have a new cardinal, Cardinal Daniel DiNardo. The archdiocese has grown considerably. There are probably 1,200,000 Catholics in Houston now and the cathedral was built in response to that growth. 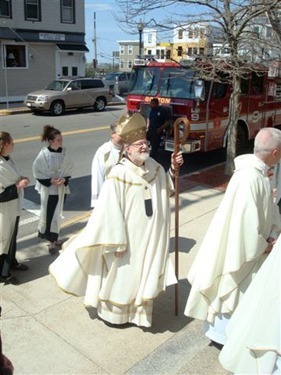 I remember when I was Bishop of Fall River the people in Sandwich wanted to build a parish church. They said: “We want a Church that looks like a Church,” because sometimes churches are built today that you could mistake for a bowling alley. Well, I think the people in Houston got a cathedral that looks like a cathedral — it is very bright, large and the artwork is stunning. They had a wonderful diocesan choir that sang for the event. 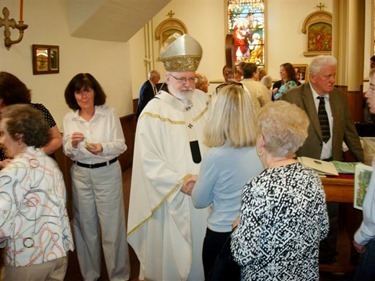 The church was filled and I and eight other American cardinals attended the Mass. 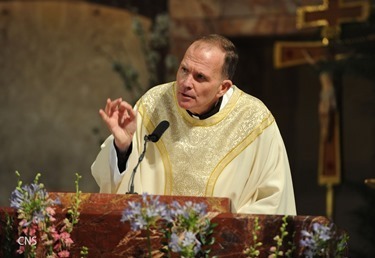 Father David O’Connell preached the homily and he always gives a very inspiring talk. Cardinal DiNardo, of course, presided at the Mass. The nuncio, Archbishop Sambi, was with us as well. After the Mass, we went to a hotel for the gala dinner. There were a number of students there from Catholic University who gave speeches. It was very impressive to see the very strong Catholic identity and commitment of faith of the institution as reflected in the testimonies of the students. There were also a number of musical programs. One student played the violin, another sang opera and a duet performed some more contemporary pieces. 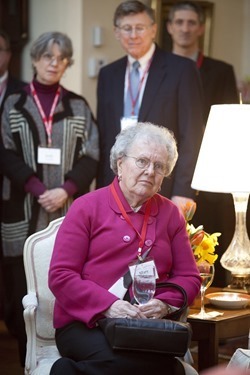 At the dinner, they presented the “American Cardinals Encouragement Award” to Sister Maureen O’Connell, the executive director of Angela House, which is a transitional housing facility for women recently released from prison. I think they raised close to a million and a half dollars for scholarships! So, having been in Houston for a few hours, we jumped on a plane the next morning and came back to Boston in time to be here for another fundraiser, the third of the week! This time it was for St. Elizabeth’s Hospital. That was also a very successful fundraiser. There was a lot of enthusiasm and hope among the hospital staff and personnel with the recent dedication of the new Emergency Room, so it was a beautiful evening. I am comforted by reading St. Paul, who spent a lot of his time taking up collections for Jerusalem, so we are following in that tradition! That same evening, Father Ignacio Larrañaga came to see me. Father Larrañaga is a Spanish Capuchin who is Basque and has spent most of his life in Chile in the Capuchin province there. During all the turmoil in Latin America at the time of liberation theology and so many other things, he never lost sight of what his role was to teach people about the interior life. He draws very much from our Franciscan traditions, but also from the Carmelite spirituality, St. Ignatius of Loyola and the other spiritual masters. His book on the Blessed Mother, “The Silence of Mary,” is one of my favorite books on the Blessed Mother. It is a beautiful biography and I encourage you to read it. Many of his books have been translated into English. I first met Father Larrañaga back in the 1981 when I was in Washington. I invited him to come give conferences on Our Lady of Guadalupe. It was the 450th anniversary of the apparition of the Blessed Virgin to Juan Diego. He gave a number of conferences, but the most striking was the a standing-room only Mass he preached at the Basilica Shrine of the Immaculate Conception. I recall it was just an extraordinary event. 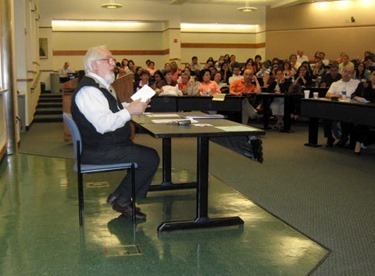 Now, at 80-plus years, he is still traveling around the world giving workshops on prayer. He came to Boston to give a talk at Boston College. They had 300 people come to this workshop, and they said that they had to turn away at least as many people because they didn’t have room! 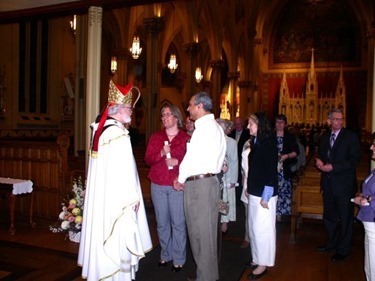 I am sorry he couldn’t have stayed in Boston the next day to have Mass in one of our Hispanic parishes, but he was off to Washington where he was having another event and then going on to Mexico to continue his work. It was a joy to see him again and he has always kept in touch over the years. 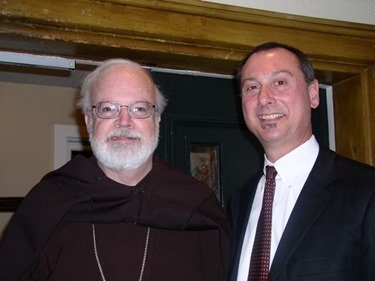 I am very proud of him as Capuchin and also very grateful for his extraordinary ministry that has helped so many people to find the path to God in their spiritual life and life of prayer. 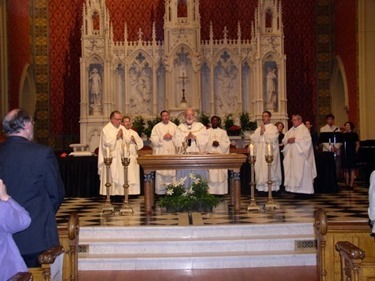 Sunday we arrived in Charlestown for the 150th anniversary of St. Francis de Sales Parish. The firemen had two fire trucks with the American flag in front of the church. 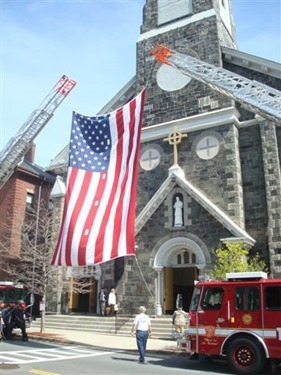 For those of you who may not know, Father Dan Mahoney, the pastor at St. Francis, is Chief Chaplain of the Boston Fire Department. The Mass was very well attended by parishioners and former parishioners, representatives of the ecumenical community, firemen and scores of altar servers. 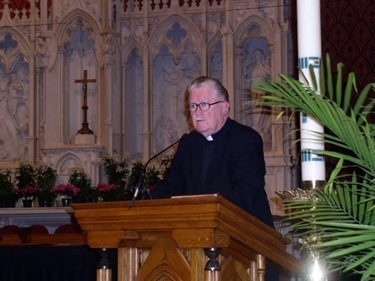 It was a very beautiful celebration of their 150th anniversary and we thanked Father Mahoney for his ministry in the parish, and to the firefighters for their presence and support. 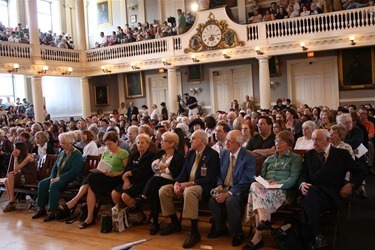 Sunday afternoon I attended the Holocaust Remembrance Day celebration at Faneuil Hall. I had been asked to make some remarks at the ceremony. The Israeli Consul General, Nadav Tamir introduced me and spoke very beautifully of Pope John XXIII and all that he had done to save Jews when he was nuncio in the Middle East at the time of the Second World War. There was also a rabbi, a holocaust survivor, who spoke. It was a very moving talk. 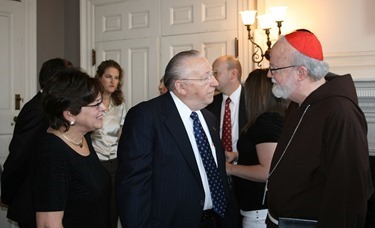 Many people told me they were very grateful to the archdiocese for hosting the rededication of the holocaust menorah at the Pastoral Center in March and for having inviting Cardinal Kasper to the event. On Monday evening, I celebrated Mass marking the one year anniversary of the passing of the foundress of the Focolare Movement, Chiara Lubich, at Our Lady Help of Christians in Newton. Local people from the Focolare Movement and representatives of other faith traditions, including Rev. 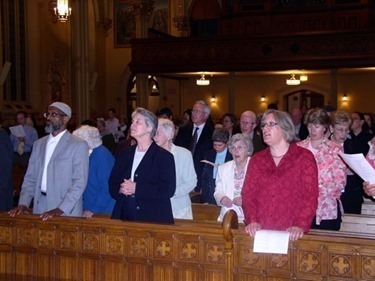 Diane Kessler and Imam Taalib Mahdee, were there to honor the memory of Chiara Lubich. She started the Apostolate when she was a 23-year-old elementary school teacher in Trent, in northern Italy. 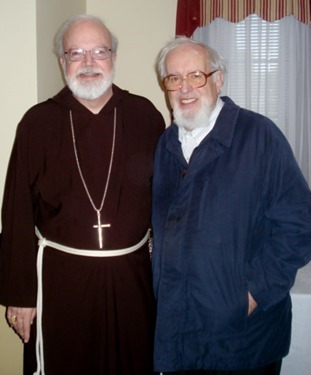 She was a lay member of the third order of St. Francis of her Capuchin parish. In the midst of the violence of the Second World War, she gathered in a bomb shelter with some of her companions and began reading the scriptures and picking out the words of life, the “parola di vita.” The first “parola di vita” was: “Father, may they all be one,” and this has become the overriding theme of the movement’s beautiful spirituality based on Christ’s prayer for unity. There are 100,000 members of the movement in the world; they have used the theme of unity to reach out beyond our own Church to other religious groups as well. There are about 35 Mariapolis, which are like small cities that they have set up, like Loppiano in Italy and Luminosa in New York, where they come together and live in the way that the first Christians did: in a spirit of great unity, following the teaching of the apostles, in fellowship, prayer, breaking of bread and communion of goods. I was privileged to have met with Chiara Lubich many times over the last 30 years and was very honored to celebrate the Mass for her. I pray that her spiritual family will grow and particularly here in the archdiocese. I think that their theme of unity and love is a great gift for us. 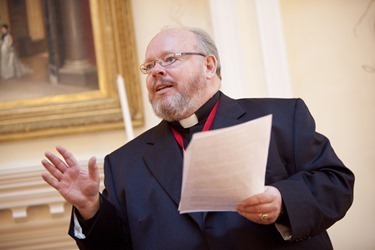 On Tuesday, Father Bill Kelly organized a conference on St. Paul. Father Frank Santilli, from the Diocese of Providence, gave the conference, which was attended by priests, deacons, seminarians and myself. On Wednesday, I had two very important meetings. 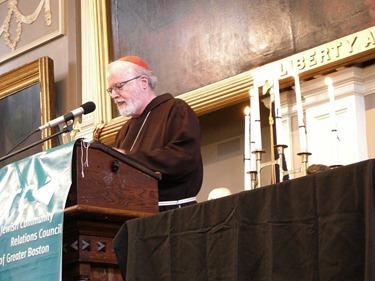 Twice a year the bishops of the Province of Boston — which includes the four dioceses of Massachusetts, New Hampshire, Vermont and Maine — gather to reflect on the pastoral challenges facing us, share information and be together. 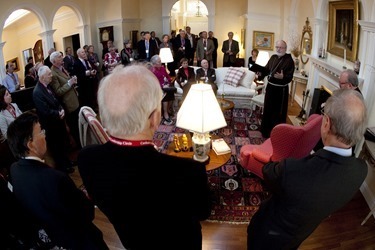 This was our spring meeting, and for a couple of the bishops it was the first time they had been to the Pastoral Center and they were very pleased to see the beautiful headquarters that we now have. Later in the evening I met with all the Boston seminarians who came to the Pastoral Center for Holy Hour, dinner and dialogue—questions and answers. I always enjoy having an opportunity to spend some time with our men who are studying for the priesthood. The holocaust was one of the most sad times in mankind. It is good to remember the victims and the errors that were made then. i thought your blog this week was great. I love the picture of the stain glass window it is so beautiful. The new Cathedrial in Houston is amazing. It’s nice how Holocaust survivors attended mass that day. Can’t wait for your next blog! It looks like you had another busy week. Wow, the cathedral in Houston is huge, and beautiful! The Holocaust Remamberance Day must have been an emotional and moving ceremony. I can not wait to read your next blog! p.s. We would love for you to come visit St.Paul School sometime! The new Cathedral looks amazing! I was amazed by the holocaust ceremony. There was so many people there! I really like to learn about the holocaust and all the people who died for their religion. I hope you visit us soon! It was very nice that you attendid the holocaust rememberence day, it must have been very emotional. Also the Houston Cathedral looks great, I would like to see it with my own eyes one day. P.S. next time your in the Boston area come visit us at St. Paul school in Hingham, Mass. As always, I enjoyed reading your blog. It was so nice of you to attend all of those fundraisers! My favorite part of this week’s blog is the section about Holocaust Rememberance Day. 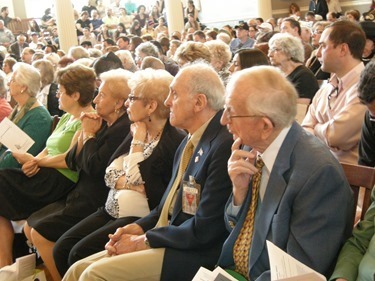 It is very interesting to see actual holocaust survivors attending mass with you. I look forward to hearing from you again! I am happy new cathedrals are being built around the country. I am also glad about how you and other people are raising money for the Catholic University. You are right, the artwork of the cathedral are stunning! The new Cathedral in Houston looks like a terrific Cathedral to spread the catholic faith. 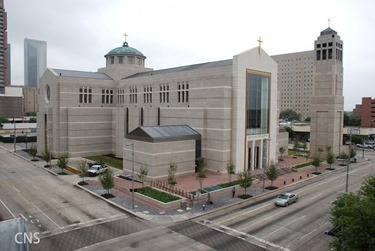 I hope the Catholic religion grows in the Houston area due to the great new cathedral. It was good to hear about how much money was raised for the fundraiser and scholarship. I also agree with you that Houston has a very beautiful cathedral and stain-glass window. 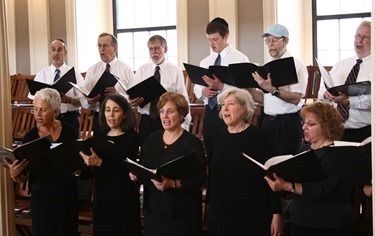 I am happy to learn that there was a Holocaust Remembrance Day celebration at Faneuil Hall. It is important to remember our mistakes in the past so we don’t make them again. At my school, St. Paul, we learned much about the Holocaust. We are eagerly awaiting your visit at St. Paul School in Hingham Mass.! While I am heartened that the Israeli Consul praised the work of Blessed Pope John XXIII for his heroic efforts in saving Jews during the Holocaust, I couldn’t help but notice the ungrateful silence about Pope Pius XII who was equally if not more heroic in saving Jews during World War II. In my opinion, Pope Pius XII has been unfairly slandered since the 1960s yet immediately after the war, he was praised by Jews and non-Jews alike for his heroic efforts in very difficult circumstances. Have his accomplishments dropped down some Orwellian memory hole? Please join me in prayer for his beatification and canonization. May the Lord bless you for your pastoral work here in Boston! Querido Padre Seán: Thank you and muchas gracias for giving us your life in service to the Lord and in service to His people. We keep you in our prayers asking our Blessed Mother to continue to take of care of you very closely so your life continue to be like the life of His Son, the Good Sheppard. Padre Sean we remember you always in our prayers and love you very much. You are a tireless worker of the Lord serving Him and loving Him in humility everywhere He sent you just as Bishop Fulton Sheen is and continues to be even more so from Heaven helping God’s people to be holy. May our Lord has piety on us and send us holy priests and holy seminarians that they want to model their lives after the life of the Good Sheppard. I loved your blog this week!!! I think that the Cathedral in Houston is gorgeous!!! 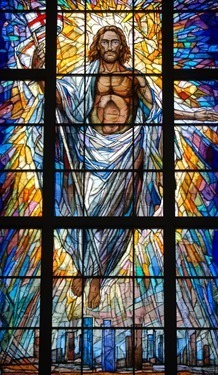 The stained glass window of Jesus is breathtaking!!!! I enjoy reading your blog, because it is full of interesting travels and information. The new Cathedrial in Houston looks amazing, they really did a great job on it. I though it was great that you did a mass in rememberance of the Holocaust. I wish I could have been there. Next time your in the South Shore you should come and visit. I love the picture of the stained glass window, which is at the cathedral in Huston. It reminds me so much of the artwork at the National Shrine in Washington D.C. I also liked learning about how you attended 3 fundraisers this week. I think it is good that people still give to the less fourtunate even in these hard economic times. Everybody needs help and for people to give what they have even though times are tough is great and I think all people who give back should be applauded. I hope you visit St. Paul School in Hingham soon! Wow, you had an exciting week! 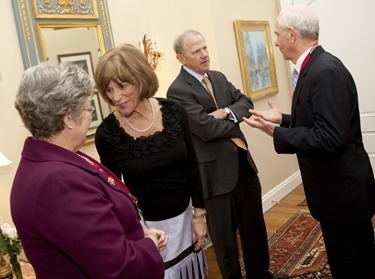 I think it was nice of you to attend the fundraiser for the scholarship money for the Catholic University of America. Scholarship money is always needed in our country to provide education for others. The stained-glass window looked truly amazing. The Holocaust Rememberence Day seemed beautiful – it is important to remember how horrible that time in our world was. I hope you can visit our school soon! The Houston cathedral seems like an amazing place to go to. Father Larrañaga seems like a great person to know. It must have been such an honor to be in a room with holocaust survivors. The ceremony, itself, must have been quite moving. Hope you can come to St. Paul School soon. The stain-glass window in the Houston Cathedral looks gorgeous. 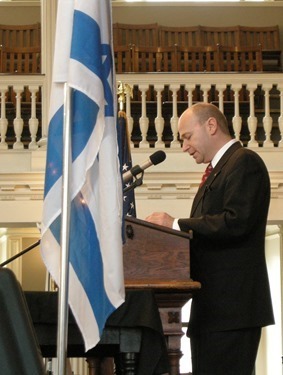 I am happy that you went to Holocaust Remembrance Day celebration at Faneuil Hall because it is important fo us to remember our mistakes in the past so they will not happen again. Also, I am glad to hear about the money raised for the scholarships. It is great to learn that people are still giving back to the community in these times. P.S. We are waiting for your visit to St. Paul School in Hingham! 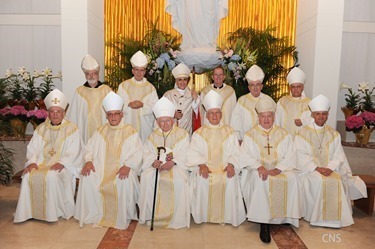 Que lindo que se haya reunido con el Padre Larrañaga y que tantos fieles sigan oyendo su mensaje de fe, esperanza y TODO SOBRE LA VIRGEN MARIA! Bellos recuerdos que siguen vivos en la memoria. The reception that you went to this week seemed really nice! The new Cathedrial in Huston looks stuning! Father Larrañaga seemed like a very interestring man. The Holocaust rememberence ceremony that you went to must have been very moving. Your blog was very interesting and I hope that we will see you soon at St. Paul School! From the photos I have seen in your blog, the new cathedral in Houston looks great! I think that the Holocaust was a low point in history, and I hope that it will never happen again. I hope that you can come and visit us soon! My name is Caroline K. and I am an eighth grade student at St. Paul School in Hingham. For the past tweo years, I have greatly enjoyed reading about your daily events and I will definitely continue reading your blog as I move onto high school. I really enjoyed your blog this week. The new cathedral in Houston is beautiful. You must have has such a nice trip. The stained glass windows are so pretty. Thank you very much for wrting your blog. In these times of economic distress, it is important that people continue donating to the less fortunate. They need help now more than ever. I think that it is great that you attended 3 fundraisers this past week. Father Larranaga seems like a very kind and spiritual man. I think it is great that he is still preaching! I would love to lisiten to him sometime. p.s. We would be very grateful if you could come to our school and celebrate Mass!